Coastal Pipco offers cash accounts for customers who do not qualify for or do not wish to set up a credit account. There are several benefits to a cash account: 1.) Product and account history are maintained, 2.) Delivery and contact information are kept, 3.) Customer specific pricing is applied consistently, 4.) The customer and his or her account can be quickly and easily identified. To apply for a cash account, please complete the cash application form (PDF). You may fax, mail or hand deliver the application to our office. In many cases, cash accounts can be set-up in our system almost immediately. 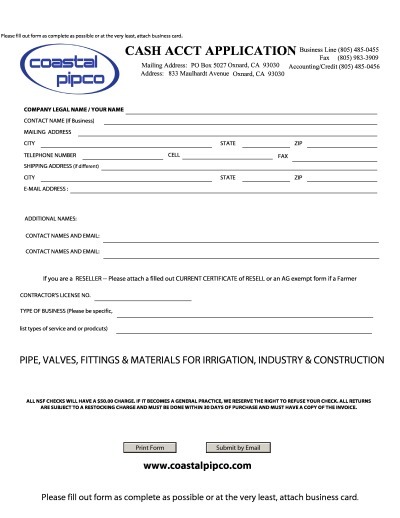 Coastal Pipco offers credit accounts with varying credit limits based on credit history. We perform our own credit checks based on the references you provide. For qualifying customers, our normal terms are 2% 10th, net E.O.F.M. Simply stated, items purchased in the current month are allowed a 2% cash discount if paid by the 10th day of the following month. Postmark determines eligibility. All invoices are due by the end of the following month. All customers receive a priced shipping ticket and are invoiced by fax in one or two working days. Statements are faxed on the 1st working day of each month. A signed credit application, with all fields completed, is required to set-up a credit account with us, however you may complete our online form to begin the process and follow up with a signed copy. Without a signed copy we can set-up a cash account only. 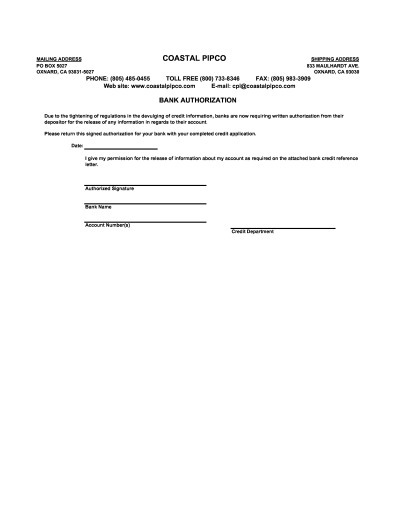 Please fill out our credit application with our terms and conditions and bank authorization. 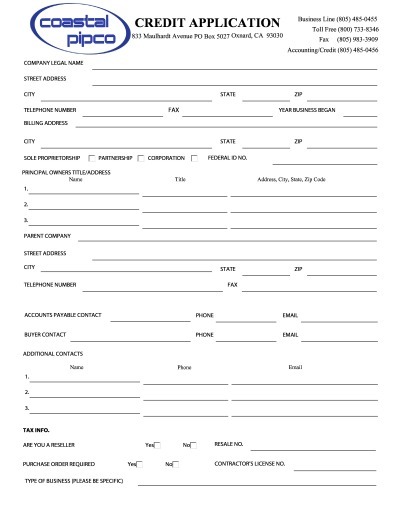 Once you have completed the application, you may fax, mail or hand-deliver the form for our review. Once your credit has been approved and your account has been set-up, you will receive a letter of approval from our accounting department.